Business practices in Japan inspire fierce and even acrimonious debate, especially when they are compared to American practices. This book attempts to explain the remarkable economic success of Japan in the postwar period—a success it is crucial for us to understand in a time marked by controversial trade imbalances and concerns over competitive industrial performance. Gerlach focuses on what he calls the intercorporate alliance, the innovative and increasingly pervasive practice of bringing together a cluster of affiliated companies that extends across a broad range of markets. The best known of these alliances are the keiretsu, or enterprise groups, which include both diversified families of firms located around major banks and trading companies and vertical families of suppliers and distributors linked to prominent manufacturers in the automobile, electronics, and other industries. In providing a key link between isolated local firms and extended international markets, the intercorporate alliance has had profound effects on the industrial and social organization of Japanese businesses. Gerlach casts his net widely. 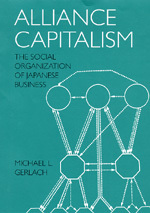 He not only provides a rigorous analysis of intercorporate capitalism in Japan, making useful distinctions between Japanese and American practices, but he also develops a broad theoretical context for understanding Japan's business networks. Addressing economists, sociologists, and other social scientists, he argues that the intercorporate alliance is as much a result of overlapping political, economic, and social forces as are such traditional Western economic institutions as the public corporation and the stock market. Most compellingly, Alliance Capitalism raises important questions about the best method of exchange in any economy. It identifies situations where cooperation among companies is an effective way of channeling corporate activities in a world marked by complexity and rapid change, and considers in detail alternatives to hostile takeovers and other characteristic features of American capitalism. The book also points to the broader challenges facing Japan and its trading partners as they seek to coordinate their distinctive forms of economic organization. Michael L. Gerlach is Assistant Professor of Business at the University of California, Berkeley.